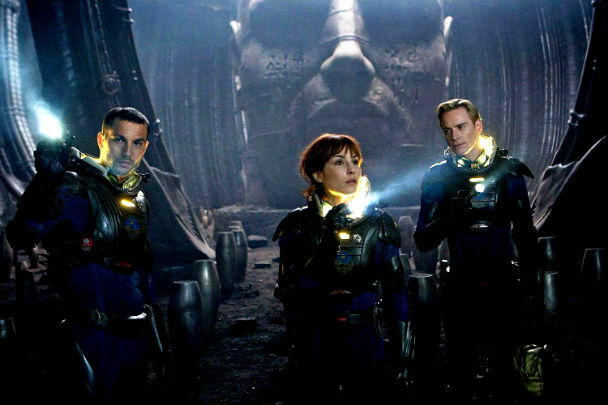 Some films are just destined for director’s cuts, and Prometheus is one of them. This film is so dense with future tech, characters, plot and tie-ins to the original Alien that all the content strains against the two-hour running time. What audiences get is something that feels truncated in almost every regard. Prometheus is still a visual masterpiece and hits the right notes in terms of sci-fi and horror, but too many inexplicable moments and under-developed characters mar an otherwise remarkable movie. In 2089, Elizabeth and Charlie (Noomi Rapace and Logan Marshall-Green) are two scientists searching for the origin of humans. During their global investigation, they discover several cave markings made by early man that clearly points to a distant location in outer space. Believing these markings as a map leading to humanity’s creators, and unable to afford the two-year-long trip on their own, Elizabeth and Charlie convince the Weyland Corporation to pay for the journey. The corporation sends high-powered executive Meredith Vickers (Charlize Theron) to ensure the company’s investment goes according to plan. She’s accompanied by a full security detail, hand-picked crew and an android named David (Michael Fassbender). When the ship finally reaches the destination star system, Elizabeth and Charlie find what they’re looking for as well as something they weren’t, which threatens to destroy them as well as all of humanity. If nothing else, Prometheus is a visual delight. From its early moments on the lush terrain of Scotland to the barren deserts of the target alien planet, each frame is crafted with an artist’s touch. Every part of the film feels alive. It’s thoroughly engrossing to watch David, the android, walk the lifeless halls of the ship, keeping busy by interacting with various technology while the crew and passengers sleep peacefully in their hyperbunks. Then later, when alien technology is discovered, the presentation is nothing short of enthralling. All of the CGI work is utterly convincing, and most of the 3-D effects are put to good use. Issues arise, however, with how the story is presented and what information is given to audiences. The biggest threat in the film is an alien liquid that can break down DNA when ingested, as one early imbiber demonstrates as his body literally falls apart before his eyes. But this effect is inconsistent throughout the film. When a human victim is exposed to a very small dose it seems to break his body down very slowly. Yet another heavily exposed human only seems to go crazy and become possessed by super human strength. Worms exposed to the liquid don’t break down at all and instead turn into large snake-like creatures. With such random results, it’s hard not to feel a little confused. As a prequel to Alien, this film doesn’t quite capture the feel of the franchise in the way that Aliens made good use of memorable technology and sound effects from the previous movie. Instead, Prometheus feels more futuristic than any of the films in the series, employing interactive holograms, dream-watching visors and do-it-yourself surgery tables. The film tries to give some tie-ins to the series as fan service, such as the emblematic Alien slime. Also, the alien vases that hold the DNA-destroying liquid stand in Face Hugger egg arrangement, but these moments seem largely forced in that it’s never explained as to what left the slime or why the vases would be arranged that way when there are others stacked neatly in another area. There are enough questions raised that it wouldn’t surprise to later find out that Prometheus originally had nothing to do with the Alien series, but that the property was shoehorned in later on. Finally, while the acting is adequate, none of the characters really have much to do or have much of an arc. Charlize Theron’s hardnosed, no nonsense character is almost irrelevant to the film, and Theron’s talent is wasted on a one-dimensional role. Other characters have a few lines to help distinguish them in the cast, like the pilots who have an ongoing bet and two researchers who have personality conflicts, but they have too little screen time and nothing important to say. Guy Pearce as the old and decrepit Peter Weyland is odd casting since Weyland is never presented as young in the film; so why not cast an older actor to play the role, instead of putting makeup on a younger actor? Noomi Rapace’s Elizabeth and Michael Fassbender’s David are the only characters to take stabs at a little more development. Elizabeth is a scientist who believes in God even though she discovers that something other than God created humans, while David is a robot who seems to achingly want to be human despite denying the ability to want. Sadly, neither character plot is explored. For fans of the Alien series, there are answers to be had for questions like What created the Alien? Or What was the creature sitting in the chair in the first Alien movie? But for every bit of the Alien universe Prometheus reveals, even more questions are raised. So while this film is satisfying to experience, one can’t help but feel there’s even more rich content to explore and possibly fill in the gaps.